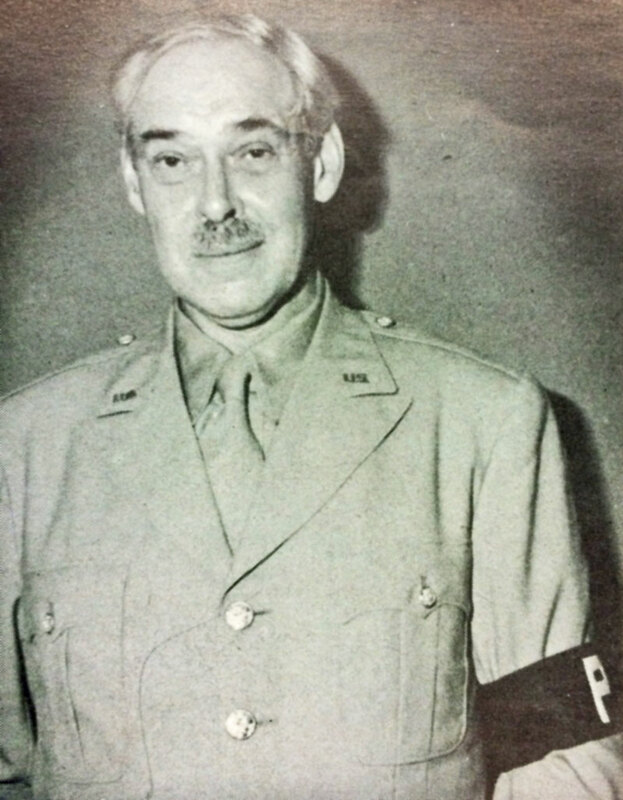 Kerr Eby (in uniform from Second World War). Bridgeport Brass News. Kerr Eby, Stuck, 1919-1920. Lithograph. Greenwich Historical Society, Gift of Meriwether Cowgill Schmid in memory of Captain W. Cowgill, U.S.M.A. '17, 19th Field Artillery, 5th Artillery Brigade, 5th Division, American Expeditionary Forces. While stationed on the front, Eby sketched wartime scenes which he later used as the basis for his anti-war art. Even though the all-terrain tank and motorized vehicles played a larger role than ever before, horses and soldiers still moved much of the equipment. 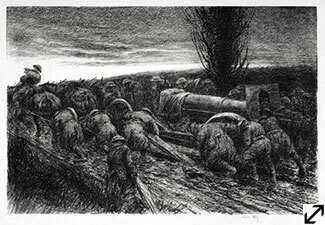 In this lithograph he captures soldiers with their shoulders to the wheels of a gun stuck in a sea of mud. The son of Canadian missionary parents, Eby was born in Japan but grew up in Canada. In 1907 he moved to New York to study art. During the early and mid-1910s, he lived in Cos Cob near the Holley boarding house (today's Bush-Holley House). When the U.S. entered the War, Eby tried unsuccessfully to get a commission as an artist, finally enlisting in the Army on June 19, 1917. He first served as a driver for the Ambulance Corps and was later assigned to the Camouflage Division where he painted battery guns in camouflage, a technique strongly associated with World War I. In April 1918 his unit was transferred to northeastern France where he fought in the battle of Château-Thierry, among others.